My sister recently brought me a carry-on size suitcase full of yarn from Arizona she had found at the Goodwill store (as if I need any more). I decided to use some of it to knit an afghan. 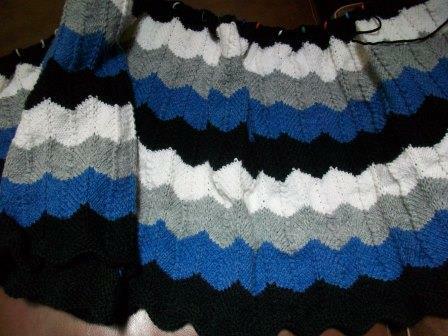 The pattern I'm using is Western Hills - The Blanket by Julia Stanfield. 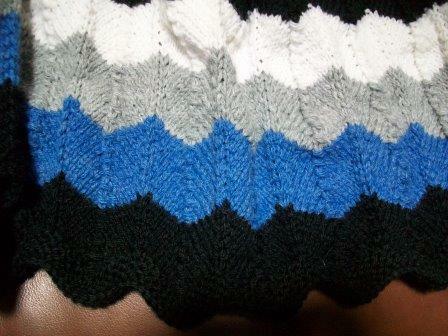 The yarn is a discontinued 4-ply Wool-Ease from Lion Brand in four colors -- black, grey heather, blue heather, and white. I'm using a size 6 needle.